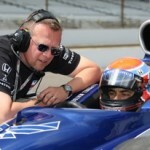 Driver Raphael Matos gets instructions from engineer Ray Leto during ROP at Indy on Tuesday. Four rookies passed the Indianapolis 500 Rookie Orientation Program Tuesday as preparations began at the Indianapolis Motor Speedway for the 2009 Indianapolis 500. The track was open for six rookies to participate in ROP. Three veterans were allowed to complete “refresher” laps. Mike Conway, Robert Doornbos, Raphael Matos and Alex Tagliani completed all four phases of ROP, demonstrating consistent driving through four speed ranges beginning at 200 mph and increasing in 5 mph increments. Paul Tracy, a veteran of five Indianapolis 500s who made his last start in 2002, turned the fastest lap of the day at 40.3426 seconds, 223.089 mph around the historic 2.5-mile oval. Thirteen-time starter Scott Sharp had the second-fastest lap at 221.878 mph. Rookie Nelson Philippe completed the first three phases of ROP, while Stanton Barrett completed two. An additional ROP session is scheduled for Wednesday from 9 a.m.-2 p.m. before the track opens for all drivers. Also on Tuesday, Sebastian Saavedra topped a Firestone Indy Lights Open Test at the Indianapolis Motor Speedway. Twenty-one drivers had five hours to prepare for the Firestone Freedom 100, which will be run May 22. Saavedra, who won the April 26 race at Kansas Speedway, turned a best lap of 47.0520 seconds, 191.278 mph. 2006 race winner Wade Cunningham was second at 190.969 mph, Martin Plowman was third and J.R. Hildebrand was fourth.